I think it’s a shame that the butterfly bun is usually confined to children’s birthdays, when they look so pretty – so here’s a slightly more elegant version, perfect for a grown-up tea party. 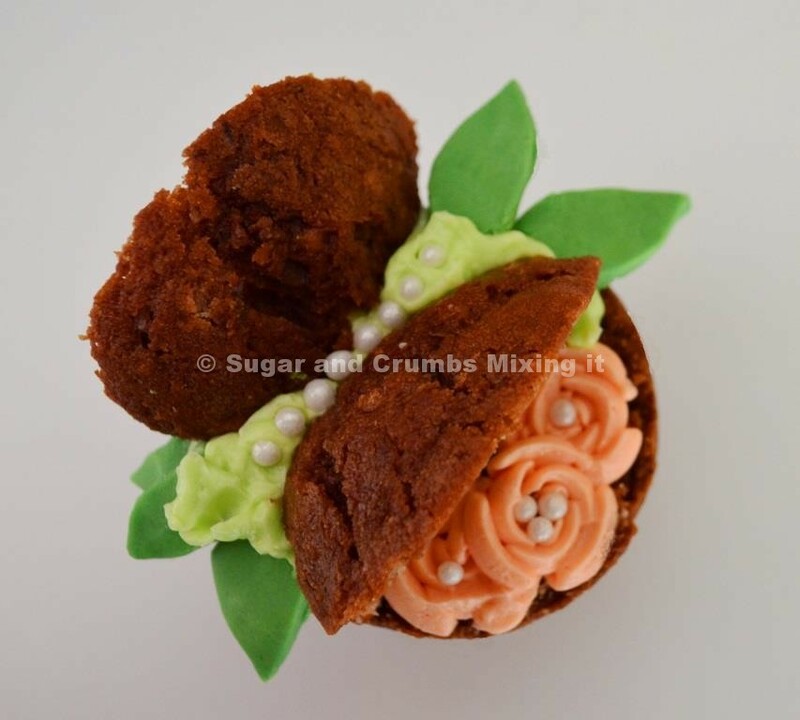 The combination of chocolate and coconut is always dreamy, so this recipe makes use of Sugar and Crumbs Chocolate Coconut Cocoa Powder for the cupcakes and Sugar and Crumbs Coconut Icing Sugar for the icing. I’ve also used Sugar and Crumbs Nifty Nozzles to pipe the flowers that the butterfly settles on – if you are going to do this, it’s important that you get the consistency of the buttercream right, so do follow the quantities given below. If the icing is too soft, it won’t hold its shape properly, and if it’s too solid, it won’t pipe. It’s also important to use gel colouring instead of water-based colouring, as it doesn’t affect the consistency of the icing. Preheat the oven to 200°C (180°C fan). Crack the eggs into a mixing bowl and whisk together until pale yellow and frothy, before adding the oil and milk and whisking again. Next, add the sugar and whisk again, and then stir in the flour and Sugar and Crumbs Chocolate Coconut Cocoa Powder – be careful not to overbeat the mixture at this stage or your cupcakes will turn out tough and chewy, so just mix to get rid of the big lumps and ignore the little ones. Grease a deep muffin tin and fill each hole about two-thirds of the way up – any higher and the cupcakes will overflow during baking. Place in the oven for 20 minutes. When the time’s up, allow the cupcakes to cool in the tin for about 10 minutes – don’t be too hasty getting them out, as they’ll be quite delicate. When you do take them out, place them on a plate to cool completely. When the cakes are stone cold, then you can do the decoration. Beat together the butter & Sugar and Crumbs Coconut Icing Sugar to create butter icing, and then divide it evenly between two bowls. Colour one pink and one green. 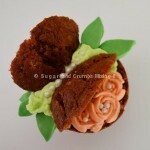 Roll out the green fondant icing to a few mm thick, and cut out three or four leaves for each bun. Use a sharp knife to cut the domed top off the first cake, and then cut the top piece in half. On one side of the cake’s flat top, pipe a couple of pink roses using your pink butter icing and Sugar and Crumbs Nifty Nozzles. On the other side, add a dollop of green butter icing, and stick in the two halves of the cake’s top. Finish off with a few fondant leaves and edible pearls, and repeat with the rest of the cakes. Sal's Kitchen is a food blogging consultancy - for more from Sal, visit her own blog here.